The Integrated File System (IFS) on your IBM i can be quite large and backing up the entire IFS can take a lot of time—and may not even be necessary. Robot Save allows you to omit entire directories, or selected objects, that do not need to be backed up regularly, helping reduce your backup time. To omit IFS directories, you must have Robot Save 11.04 and Robot Corral 2.13. To specify directories to omit, you create an object list containing the directories using Robot Corral and then set up a Robot Save backup set to omit the selected object list. In Robot Corral, display the Work with Object Lists panel. Press F6 to create an object list. On the Object List panel, enter the name, description, and retention type for the object list. Select D (directory) as the Selection Type. Press Enter to display the Directory Selection criteria. Note: You do not need to complete the Select Using File Dates section and the Include subdirectories field. If you enter values in these fields, Robot Save does not use them (this is an IBM limitation). You can use the File name filter field to filter objects in the specified directory. If you do not specify a file name filter (recommended whenever possible), the default, *ALL, is used and the resulting object list automatically omits all subdirectories below the selected directory. For example, if you select to omit the /notes directory, all objects in /notes, including all objects in subdirectories, such as /notes/server1/*, are omitted from the backup. If you do specify a file name filter, only objects in the chosen directory that match the file name pattern are omitted from the backup. Subdirectories under the specified directory are not omitted (this is an IBM limitation on the SAV command). For example, if you select to omit files that match the pattern /notes/*.n?f, only objects with .NSF and .NTF extensions in the /notes/directory are omitted. Objects in a subdirectory, such as /notes/server1/*.n?f, are not omitted. To omit these subdirectories, you must create additional object lists and specify the subdirectories you want to omit. You can create as many object lists as you need. 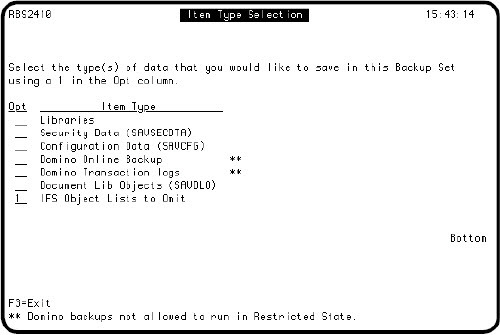 Robot SAVE allows you to specify up to 290 omit-type object lists for each backup set. Press F4 in the Directory path field to display the Directory Finder panel. 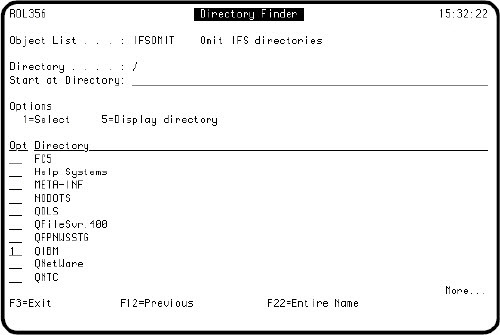 Enter a 1 next to the IFS directory that you want to omit. You do not need to build the object list in Robot CORRAL. Create a backup set. 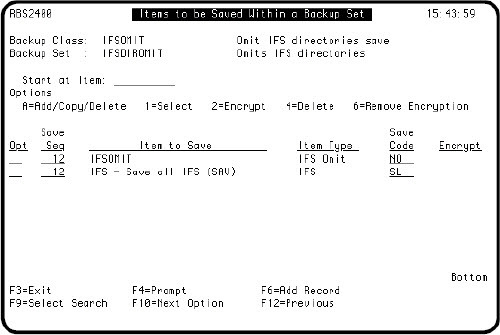 The backup set can be type 9 (Save Entire System) or type 1 (User-Defined) to save the IFS. For a type 9 backup set, skip to step 3; if you are using a type 1 backup set, continue with step 2. On the Items to be Saved Within a Backup Set panel, press F6 to select the type of item to be saved. Select either Save All IFS or IFS plus Domino databases on the Item Type Selection panel. The Items to be Saved Within a Backup Set panel redisplays. On the Items to be Saved Within a Backup Set panel, press F6. 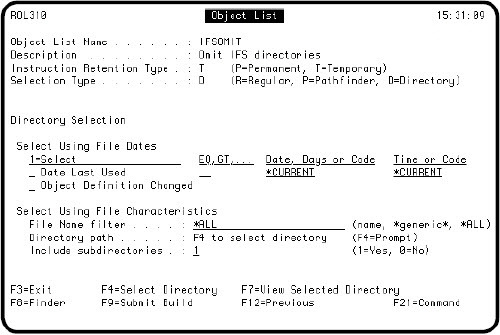 When the Item Type Selection panel displays, select IFS Object Lists to Omit. 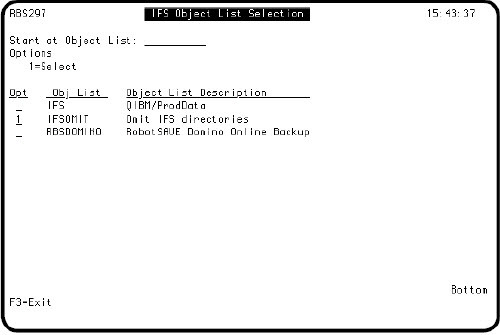 The IFS Object List Selection panel displays allowing you to select the object lists to be omitted from the backup. Enter a 1 next to the object list containing the directory you want to omit. You can specify up to 290 object lists to omit for each backup set. The Items to be Saved Within a Backup Set panel now shows the object lists you selected with a save code of NO. You cannot change the save code for omitted object lists. When the backup runs, Robot Save automatically builds the RBSSAVIFS command with the omit parameters based on the selected object lists. Robot Save can omit a maximum of 290 directory-type object lists from a single backup set, with a total of approximately 21,000 unformatted characters in the omit parameter, based on the directories selected. If your directory names or file name filters contain single or double quotation marks, they become case-sensitive and you may need to create multiple object lists to get the desired results. To test that you are omitting the correct files, you should run a save and review the results.